NASTT’s Trenchless Today magazine published by Benjamin Media, Inc. NASTT’s Trenchless Today magazine published by Benjamin Media, Inc. 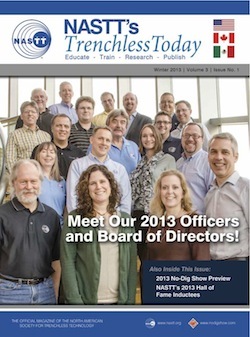 The North American Society for Trenchless Technology (NASTT)’s Trenchless Today magazine focuses on NASTT members. The three issues published each year include NASTT news, trenchless project updates, technical papers and information on upcoming educational events. We also highlight outstanding members throughout the year, including NASTT’s Hall of Fame inductees and give you everything you need to know about NASTT’s No-Dig Show.